Pavi's Platter: Triple Millet Bagala Bath ! Bagala Bath or simply called as curd rice is one comfort food for any one especially the vegetarians when they travel or go to a restaurant. But a very good healthy replacement for rice in this is millets. Try this once and you will never want to make it with rice again. I used three types of millet in this and I even pack this for lunch for hubby. It tastes just like your normal curd rice. 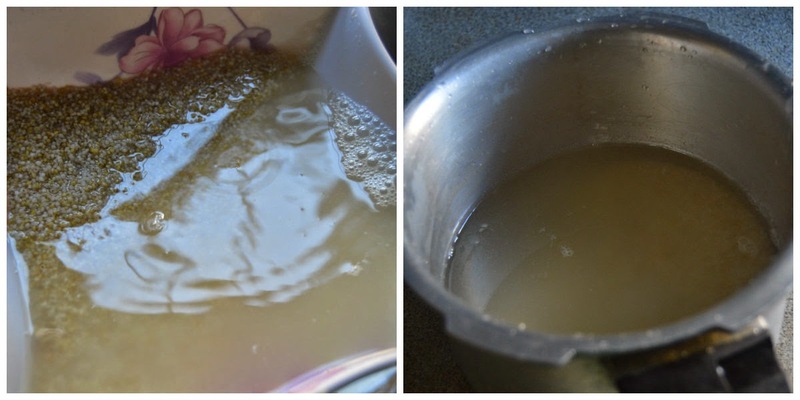 Wash the millets thrice well in water and cook in pressure cooker with salt and water for 2 whistles. Add 2.5 parts of water for one part millets as we need a little mashed consistency for curd rice. In a small kadai / tadka pan, add oil and once hot add the dals and fry them till golden brown. Fry the groundnuts for few seconds and then add the grated carrot and raisins and saute for half a minute and turn offf stove. Now add this tadka to the cooked millet and mix well. If you are paccking for lunch box in the morning or generally going to eat it later then add half milk and half curd and mix. For immediate use add only curd/yogurt. I used some milk as i was packing for lunch Then add curd and mix well. 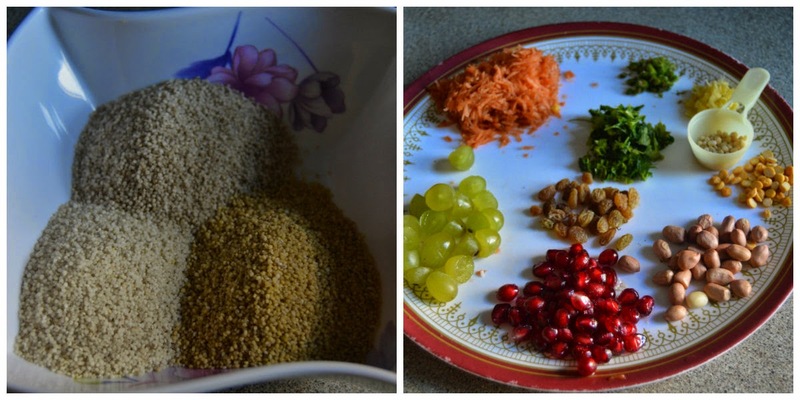 Add chopped fresh coriander and pomegranate seeds and halved grapes. Reserve some of these for final garnish as well. Serve with a spicy potato fry / fryums and pickle. Heavenly ! Healthy !